Early one January morning, awakened by the kicks and twists of my gestating daughter, I looked out the living room window, eager for a glimpse of a black-capped chickadee, a northern flicker, perhaps a great blue heron cresting my residential Phinney Ridge neighborhood. My daughter wanted to come into the world as much as I wanted to leave the empty days of a doctor-ordered bed rest. For months now I had watched my husband and our friends go to work, book clubs, potlucks, dances, movies, and coffee houses while I had lain flat on my back atop the sofa and waited for another day, another week, another month of pregnancy to pass. My excitement over being pregnant had faded as my world narrowed to my MacBook Pro laptop, our wireless Internet service, and my view from the living room windows. In a reprieve before I had to once again lie down, I looked past our barren rose bushes and searched the grey Seattle morning. I yearned for beautiful birds to enchant me, for wild birds to inspire me with their freedom to fly the world over, for native birds to remind me that my small home was part of a much larger place. Instead, I saw starlings. As a nature writer and naturalist, I keep my binoculars and well-thumbed copy of the Field Guide to the Birds of North America within easy reach, but I didn’t need either to identify those all-too-everyday nuisances. A flock of thirty or so of the small, pointy-winged starlings swooped between parked Saturns and SUVs, darted over my lavender, hovered above the rosemary bushes, and then clustered like sentries posted on the telephone lines. 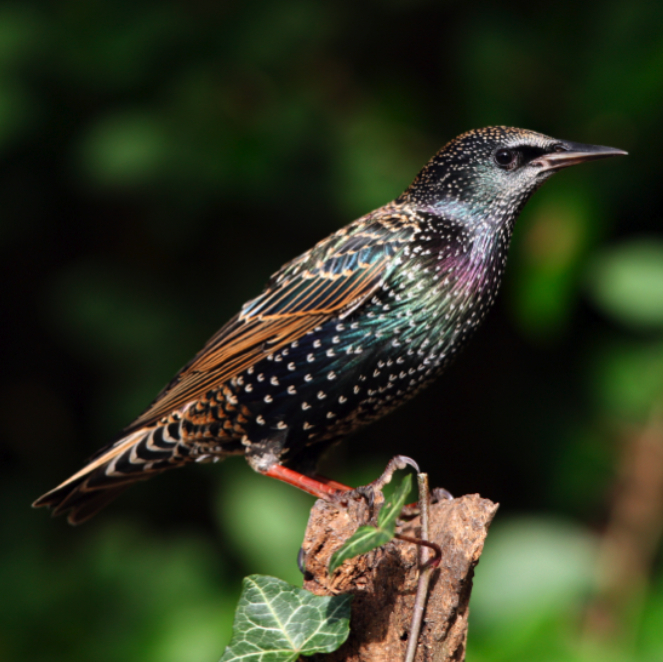 I’ve heard more than a few birdwatchers call starlings the sky rat, the weed with wings. Those are the nice things said about starlings. True, I’d had moments when I would admire the iridescent green gleam along a starling’s back and breast, or the flecks of green and purple along its glossy black wings. But mainly, when I wasn’t ignoring starlings, I scorned them as pests. Or to be more scientific, I scorned the starlings as an invasive species. Starlings aren’t native to the United States, but were released in New York City’s Central Park in 1890—part of an effort to bring to North America all the birds mentioned in Shakespeare’s plays and poems. I’ve seen my share of North America’s 200 million or so starlings in habitats as different as suburban backyards, city downtowns, and countryside fields. More than once, I’ve watched in amazement as gregarious chatterings (as the flocks are called), large enough to look like tens of thousands of birds, flew between the street trees of Seattle’s Pioneer Square to old brick buildings in search of a twilight roost. The starling’s easy adaptability to urban, suburban, and rural areas means they can quickly invade a place and monopolize cavity nest sites, food, and other resources. The starling population grows and grows, while the wrens, flickers, woodpeckers, swallows, and other native birds I love to see find themselves at a disadvantage from the aggressive newcomers. But that January morning, I forgot to dislike starlings. I certainly couldn’t ignore them. The starlings alighted on front yards and pecked amid the winter-gold grass. They came to earth, but I was aloft with joy. My bare feet tapped the wood floor. My imagination flew with the starlings through a sky of “what if…” and “where to next…” flying above our street of vine maples and white-trim homes, past the red-brick community center, and above the Starbucks. We took wing northward to the Skagit Valley, where we’d dodge red-tailed hawks and peregrine falcons, or journeyed eastward toward the farms of the Snoqualmie Valley. Or we might just fly and fly until we came to a place I’d never seen. Before this morning, starlings had been too everyday and ordinary to be an inspiration. Certainly ecological terms like “aliens,” “exotics,” “foreigners,” and similar labels, used to describe non-native species, helped to turn my eyes away from the starlings. That emotion-laden language of borders and boundaries has little to do with what an animal is—and everything to do with who controls the landscape: us, or them. Poison or trap them, haul out the gunshot and tear out their nest sites, the starling persists in claiming a space alongside us. Why not? Didn’t all species evolve on Earth’s common ground? Didn’t that give us an evolutionary kinship with all creatures, even starlings? With that realization, I saw starlings as if for the first time, as invasive yet part of the landscape I call home, as nuisance yet wondrous creature. The starlings rose. Their graceful flight took them around my neighbor’s apple trees and away from our tabby cat. The starlings flew with the freedom all birds have to journey, to wander, to explore the vastness of our world, and to do it with the closeness of kin and companion. How I wanted that same freedom! Watching the starlings dash across roofs and between chimneys, I remembered what I’d forgotten in the boredom of the last few months. In just a few more weeks, I would have the freedom to lace up my shoes, open the front door, and go out into that big world. When I did, I would not be alone. My daughter would be exploring the world with me, one day seeing starlings for her first time, and someday reaching her own conclusions about these annoying, enchanting birds. The starlings hovered, turned as one, flew up the street, crested the hill, and were gone.